I dive back into more HG Wells cinematic adaptations with the Sci-Fi Chronicles book, settling in to rewatch the Spielberg take on the classic invasion tale, done so well in the previously reviewed 1953 film. Spielberg’s updated take on the story is a modern, post 9/11 version which tries to walk the line, mostly successfully between modern sensibilities and storytelling and the original beats, moments and of course original ending of the novel. My two biggest issues with the film were the survival of Robbie (Justin Chatwin), and the revelation that the machines had been planted here long ago, simply waiting to be occupied. For the most part, I feel, the rest of the film works, and is still highly enjoyable. 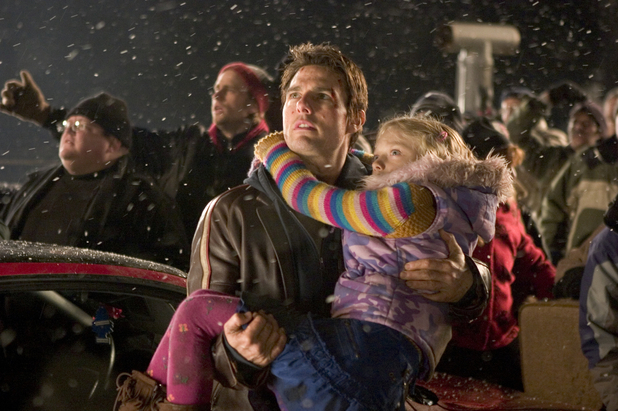 Spielberg directs, with the requisite John Williams score, Tom Cruise as Ray, a dock worker, who, this weekend, has custody of his kids, Rachel (Dakota Fanning) and Robbie, while her ex (Miranda Otto) goes away for the weekend with her new husband (David Alan Basche). Unfortunately this weekend is going to be a bad one… Strange storms are striking the entire planet causing massive power outages and releasing EMPs. And riding the lightning, down into the earth and into the waiting machines are invaders from Mars who quickly begin to lay waste to humanity, in a suitably shocking and disturbing sequence with their terrifying weapons, and the 9/11 mentality is conveyed perfectly in one dark moment when Rachel asks if it’s the terrorists. Spielberg proves he’s still a master when it comes to creating tense scenarios and action moments, as the attack sequences are incredibly intense, as humanity realizes that there may, in fact, be nothing they can do about saving themselves or their planet. Cruise is put in the signature Spielberg role, the Everyman put into extraordinary circumstances, doing so believably, trying to balance being a father, with trying to think beyond himself and his own survival to include that of his family. There are horrific moments throughout the film as we are given an opporutinity to view the worst and sometimes the best of humanity. Most of Wells’ original beats and set pieces are included in one form or another, tweaked and slightly modified, of course, for the modern viewer. By example, Tim Robbins turn as Ogilvy is suitably creepy and still hits all the moments Wells originally created, and pushes Ray to do something he never thought he could, and leaves him numb with shock, tumbling through the red weed that seems part and parcel of the invasion. Also hinted at, is the suggestion that the Martians are using humanity as a food source of some sort, or at least enjoyably imbibing our bodily fluids. 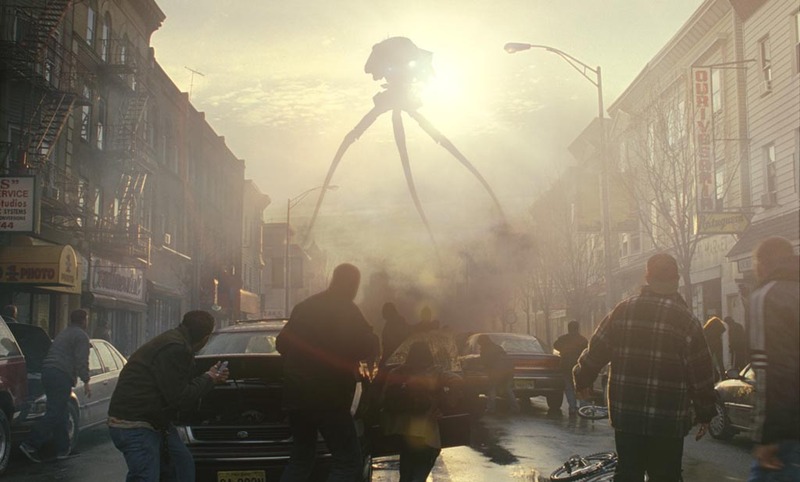 The original ending of the book, featuring the fact that bacteria wipes out these invaders, while faithful to the book doesn’t have the same resonance it no doubt did when originally published… I mean wouldn’t a sufficiently advanced race who could travel between worlds know something of biology and be aware of the possibility of differences and dangers in bacteria and viruses from place to place. On the whole, the film works rather nicely, and looks great, as Spielberg films tend to do, and makes a darker companion piece to the original novel, the 1953 version, and one of my personal favorites, the Jeff Wayne album!